It’s the end of 2014 — and you know what that means when it comes to books, right? Reviewers and readers are making their lists and checking them twice, a la Jolly ol’ Saint Nick, who is now resting up for next December. Only these lists have nothing to do with who’s been naughty or nice — no, it’s all about nice, nice, nice. Or should I say best, best, best? Yes, ’tis the season of The Best Books of 2014, brought to you by reviews and readers and publications like The Library Journal and Publisher’s Weekly. As readers, you’ve probably compiled your own list of “best books for 2014” — the romance novels you’ve read more than once this past year, flipping to favorite scenes for a chance to recaputure real-life emotion woven by an author through imaginary characters. If you’re like me, it’s hard to narrow your favorite books down to your top one for the year. Some of us can’t even compile a Top Ten list. It’s just too hard to choose. But I am going to ask you to choose one today — and I am going to ask you to do it twice. But — and here’s the plot twist for today’s blog — I’m not asking you to choose a book. #1 Choose a favorite author — just one — and plan to support them during 2015. How can you support your favorite author? Write them a note of encouragement. Tell them why you like their writing or why you like their lastest release or that you’re looking forward to reading their upcoming novel. Most authors have a way for you to contact them on their website. Post a positive review of their book(s) online. Think Amazon and Goodreads and Barnes and Noble and CBD.com. As a writer-friend told me: Positive reviews are gold for an author. Reviews don’t have to be wordy, but saying a specific reason why you loved the book helps. Shout out your favorite author’s book. Tell your friends, “Hey, so-and-so author writes wonderful inspirational romance novels.” Post a positive comment about them on your Facebook page or via Twitter. 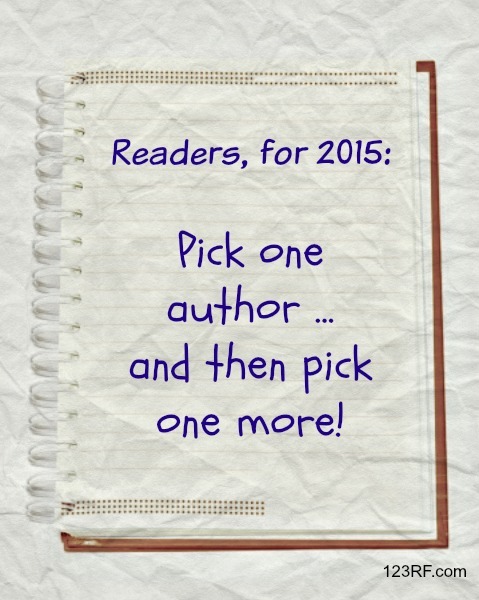 #2 Choose a new-to-you author — one you haven’t read yet — and give them a try in 2015. Look for upcoming releases in 2015. We talk them up here at Inspy Romance. Another resource is Fiction Finder, sponsored by American Christian Fiction Writers (ACFW), which lists a wide range of Christian authors — romance and a whole lot more. Try a debut novelist or an author who has an established award-winning career. Not sure who to pick as a new author? Ask a friend for a recommendation. Go ahead, have some fun in 2015! Beth believes God’s best is often behind the doors marked “Never.” She’s a former nonfiction writer and editor who said she’d never write fiction. But then God turned a season of burnout into a bend in the writing road. Now she writes contemporary romance set in the Colorado Rockies, including: Wish You Were Here (2012), Catch a Falling Star (2013), and Somebody Like You (2014). Beth also serves as the Skills Coach for My Book Therapy. Check out Beth’s books at bethvogt.com. I think I did this ten times over this year. :) One of my favorites: you. One of my new-to-me’s: Sarah Sundin (in Where Treetops Glisten; I’d already known Tricia Goyer’s work was amazing, and Cara Putman was another new-to-me earlier in the year with Shadowed by Grace). That book (Treetops) was probably in my top three this year. Don’t worry, I’ll be doing this again next year. I just got a couple books by Lisa Wingate for Christmas (new-to-me), and I have a feeling I’ll be reading more from you, Melissa Tagg, Carrie Turansky, JoAnn Durgin, Kim Vogel Sawyer, Lynette Eason, etc., etc., etc. Honestly, this list is probably a mile long. You said it was hard to narrow down your favorite book list, right? Well, for me, it’s hard to narrow down my favorite author list, as well. Thank you, Andrea! You are the kind of reader that authors so appreciate!